How many medieval Irish Castles are there? Too many to count. Apparently, over 30,000 castles and castle ruins are dotted all over the Irish landscape. There are some large, significant and well-known ones such as Bunratty Castle in County Clare, or Blarney Castle in County Cork. 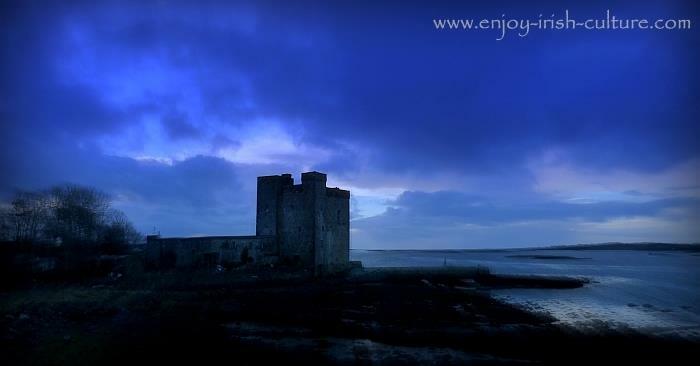 Oranmore Castle, County Galway, right on the seashore, was once of military importance during the siege of Galway in 1649. Nowadays the castle is privately owned. But many people don't realize that beyond those large visitor attractions Ireland is actually peppered with smaller local castles. Many of the medieval castles are ruins of course, but others have been lovingly restored. In this section, let us introduce you to everything we know about these medieval Irish castles. Later on, other types of castles were built in later architectural styles. We are discussing those on the page 'Big Houses and Revival Castles'. 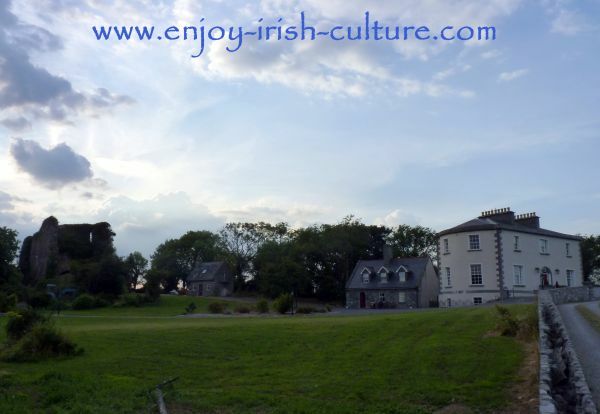 Scroll down the page for plenty of links to all our pages on castles in Ireland! But first, let's talk history. Before the arrival of the Normans in Ireland, the prevailing style of building fortifications was the building of different types of forts, such as the gigantic stone forts on the Aran Islands, or ring forts forts made by piling up earth. Gealic clans used to live in wooden or wattle and daub housing inside the protection of these forts, and there was enough space for cattle as well. When the Vikings started to settle in Ireland in the mid-eighthundreds, they, too started building wooden fortifications, so called longphorts. At the Viking settlement in Dublin they built a wooden fortification on the site of what today is Dublin Castle. Why did they need fortified residences in the first place you might ask. Well, in those days there was a lot of conflict between neighbouring families or tribes. You could never be sure to be safe. This continued to be true into medieval times and was the reason why fortified Irish castles were built by the Normans. 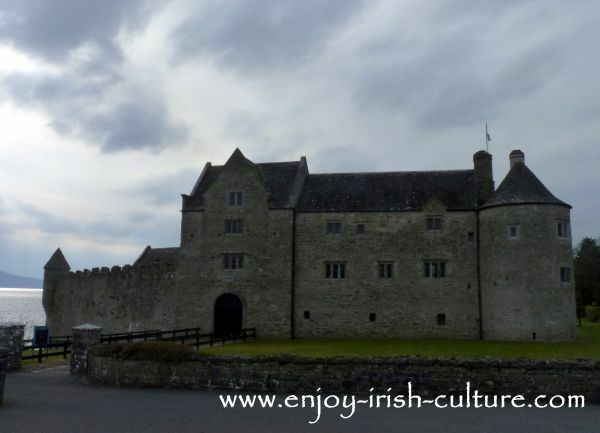 Parke's Castle in County Leitrim is beautifully restored and a great example of a late medieval castle worth the 25 minute trip from Sligo town. The story of Irish castles as such starts with the Normans. They arrived first in 1169 AD. Because they had better war technology than the Irish who did not have armour at the time, and used inferior weapons such as axes compared to the invaders, the Normans were very successful. Many Irish chieftains had to accept the Normans as overlords and pay them dues while existing side by side. The castle at Shrule, County Mayo on the photo above was built by Normans in 1238 and held out through many a battle. Subscribe to our newsletter (left column) and get to take our free course on Irish castles! The Normans were extremely adaptable. Wherever they went, they became fully integrated into the country within a couple of hundred years. Once in Ireland, some Normans started adopting the customs of the Gaelic tribes. They might have started to speak Irish, too. Other Normans spoke Welsh, French or English. There was quite a cultural melting pot there among the Normans and with that it was no surprise that wherever they went, they picked up technologies and brought them with them. Among the technologies the Normans brought to Ireland was the building of cut-stone fortified Irish castles. The building of these castles started about a generation after their arrival. 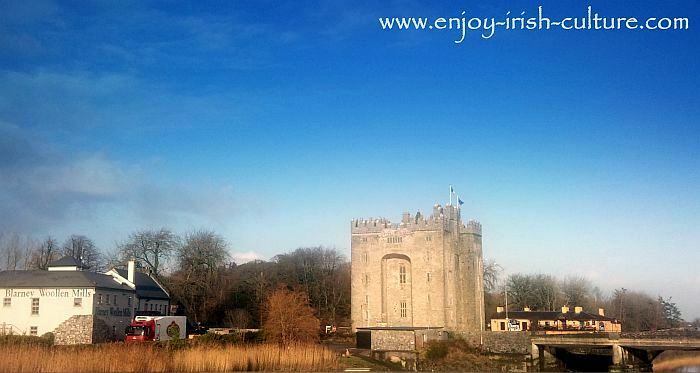 Bunratty Castle at Bunratty, County Clare, Ireland, is one of Ireland's best medieval castles. After conquering enemy territory, the Normans would first erect a wooden fortified structure, a Motte and Bailey, surrounded by wooden palisades for additional layers of defense. This would later be followed up by building a fortified castle. These castles started to appear in Norman strongholds in Ireland from the 13th century. You will find them in fortified towns, with good and relatively intact examples being Trim, County Meath, Kilkenny, Ballymote in County Sligo and Athenry in County Galway, see also the photo above of Shrule Castle in County Mayo. 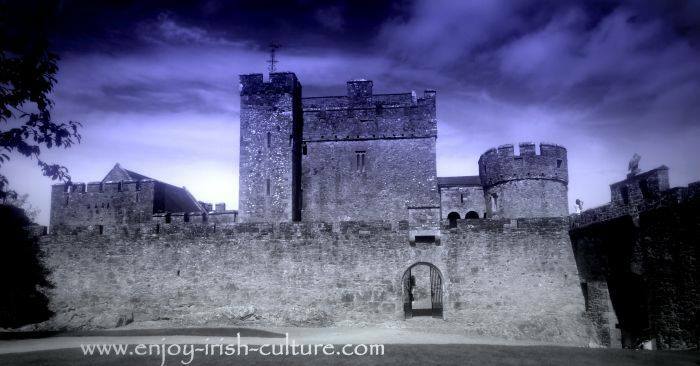 Cahir Castle, at Cahir, County Tipperary, was once considered Ireland's safest castle. 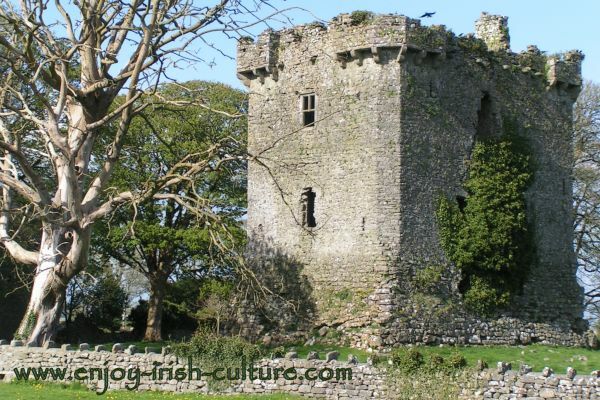 So called Norman tower houses, a form of fortified country residences, which is peculiar to Ireland and Scotland, started to appear in Ireland in the 13th and 14th centuries. But although it had been the Normans that introduced the technologies of building castles, the Gaelic tribes adopted them as well. The Gaelic O’Flaherty’s in Galway, for example built a fine tower house, Aughanure Castle, in Oughterrard. 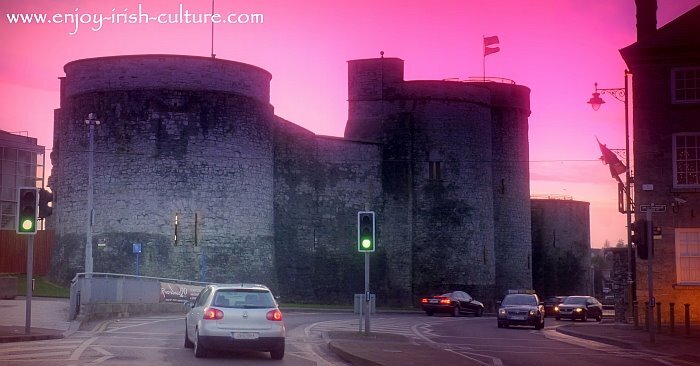 Limerick Castle, or King John's Castle, recently renovated and updated with a high tech exhibition centre is a great day out for the whole family. With the existing war technologies of the time, these castles were very defendable. After the invention of guns and canons however, fortified castles became obsolete. These were gradually introduced in Ireland throughout the 17th century. During the Cromwellian invasion of Ireland which started in 1649, heavily fortified towns such as Waterford and Wexford were won with heavy assault guns. It became clear that medieval castles designed for siege warfare could no longer be defended against an army. You might just about be able to defend against an angry mob of peasants! The conclusion was that you might as well live comfortably and show off your wealth. This idea formed the beginning of a new era. Some medieval castles were remodelled at this stage, for example Kilkenny Castle or Roscommon Castle below. Others had been destroyed during or after the Cromwellian conquest of Ireland when a lot of castles were 'decommissioned', rendering them useless by destroying defensive staircases and battlements. With the onset of the new era of castle building, a lot of surviving medieval Irish castles were now abandoned for new builds of comfortable and spacious country mansions built in different styles. The new building styles for big houses and revival castles varied and usually corresponded with whichever architectural style was fashionable in Britain at the time. The photo above shows a great example of a castle and big house existing side by side. You can see Ballycurrin Castle (on the left, covered in ivy) and Ballycurrin House in County Mayo, Ireland, standing close together on the same site. If you enjoyed reading about Irish castles as much as we enjoyed ourselves putting this content together for you, please take some social action! Thanking you.